I went up to Belfast on Saturday. 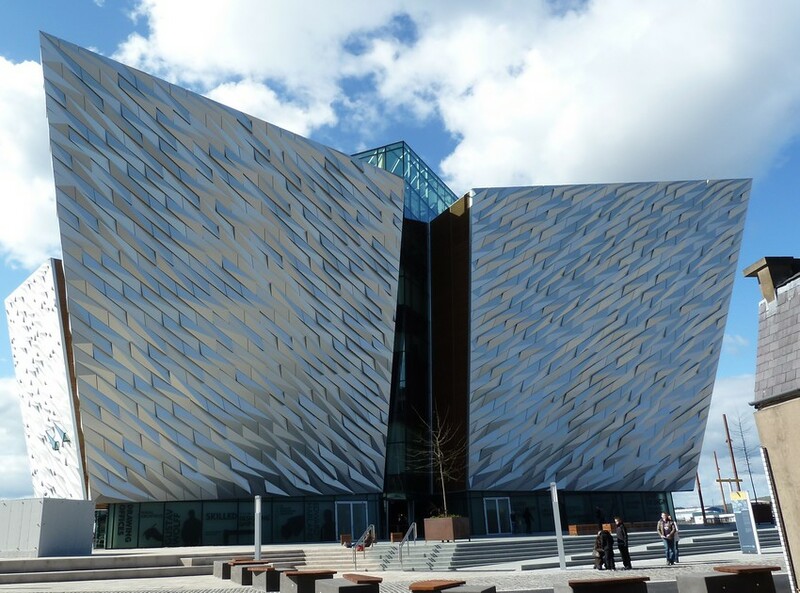 In fact, the whole family went to Belfast on Saturday to go to the new Titanic center there and to be part of Belfast's Titanic festival. It still amazes me how much I know about the Titanic these days. Before 2007 I knew no more than anyone else who ever watched A Night To Remember. I hadn't (and still haven't) seen Kate and Leonardo in Titanic from the mid 1990s. When I think back to the 80s the fact that someone found the Titanic only barely registered. All that changed after my (then) 7-year-old son saw A Night To Remember. Who can understand the workings of a the 7-year-old's brain, but from that experience was born an obsession. He had to know more. No, he had to know everything. Birthday and Christmas presents included Titanic books and Titanic DVDs - movies and documentaries. There is a cartoon Titanic movie and Barbara Stanwyck starred in a movie called Titanic released five years before A Night To Remember. Who knew? Not me anyway. We indulged him, probably too much. We took him to Belfast for the first time in 2008. The memory still makes me laugh. We drove to the Harland and Wolff shipyard to show him the place where the Titanic was built. 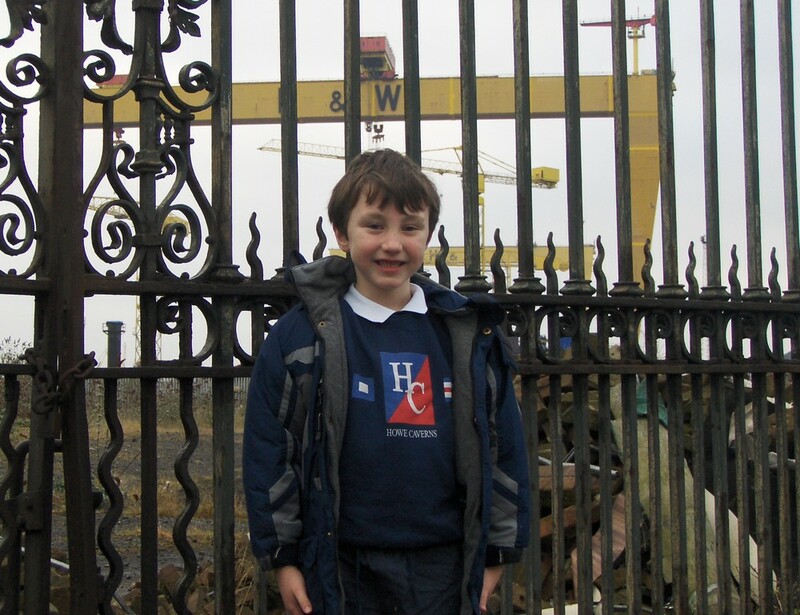 My son, smiling, at Harland and Wolff, Belfast 2008. Note the pile of rubble behind the rusty gate. We were all looking at an industrial ruin, but he was seeing something else, something tangible to connect him to this legend he had been reading and learning about. His face was lit up with excitement. We took a free tour of the shipyard run by enthusiasts and he loved every second of it. We stood in a huge, wreck of a room, but it was the room where the Titanic was designed. He was thrilled. 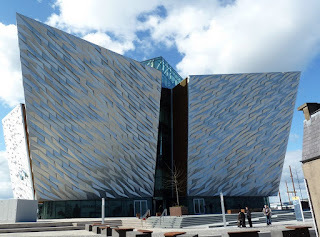 Since then we've been back up to Belfast a couple of times to visit Titanic sites and exhibitions. We have also been to Cobh and Southampton touring both cities' Titanic-linked sites. We even made it to the Titanic Museum in Indian Orchard, MA. 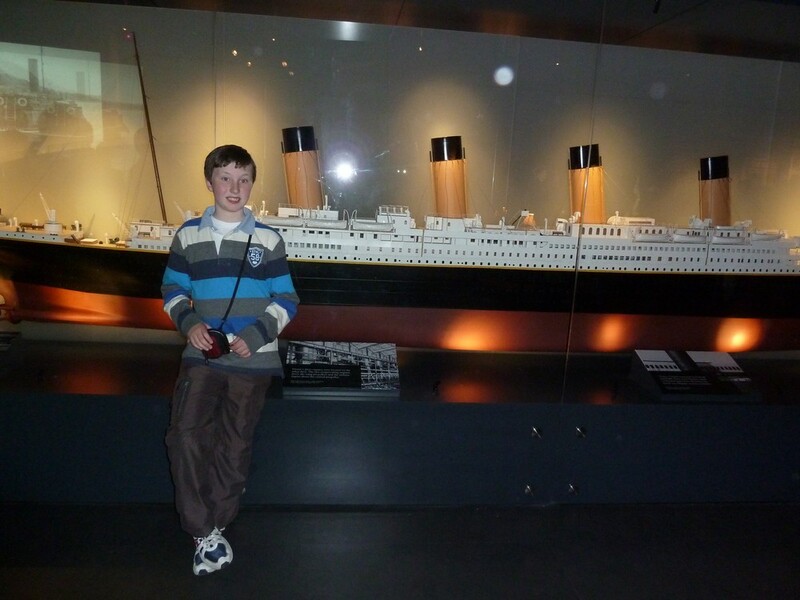 Thanks to his keenness we have all learned a great deal about the Titanic, thrown ourselves into his interest and although some are more enthusiastic than others, I think it's fair to say we were all looking forward to the visit to the new Titanic center. I don't want to say we were disappointed, but we were far from blown away. I came away hoping - hoping because I really want Belfast to get this right - that this was really a first effort and the exhibition can be changed to make it better. Given that all the reviews I've seen have been glowing I'm feeling sheepish about my misgivings. However, I thought it was missing something. There are too few actual artifacts to call it a museum and there was far too much reading to call it an interactive or multimedia experience. There was so much reading, in fact, that I left with my head hurting and a sense that I'd missed a lot. The centerpiece - the five minute 'Shipyard Ride' - fell far short of my expectations. I thought it would be a Disney-esque journey up and down, inside and outside the Titanic. Instead it was really minutes sitting down looking at recreated scenes of men working. There was no real sense of scale, which is what I was expecting. I guess I was kind of surprised by how 'high-brow' the whole thing was. We weren't allowed to see, let alone climb, the grand staircase. They did put one in the building, but it's off limits to those plebes who merely paid for tickets to visit. Also, the building is a series of ships bows, but nowhere in the center are visitors given that "I'm standing on the bow of the Titanic" moment that I was sure would be there. There should be an outdoor Titanic bow. There is also very little for younger children. The few hands-on exhibits for kids are a little dull and seem more adult or at least teen-focused. 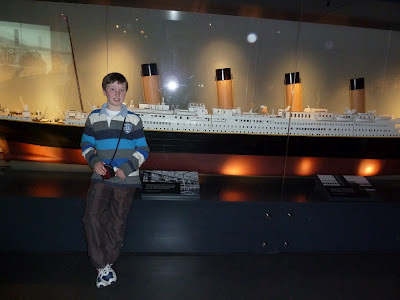 I was really surprised by this because when he was seven my son loved the Titanic experience he got up the road in Holywood, Co Down when we visited the Ulster Folk and Transport Museum. I just assumed the new center would borrow heavily from that. I don't want to be too negative. We did have a good time. I enjoyed lots of it and my son loved more. He loved the giant photographs, the model of the gantry, the giant models of the ships, the staterooms, etc. Maybe my expectations were too high. I just can't help thinking it's a little too much history and too little Hollywood, especially too little Disney. After all, the reason we all still recall Titanic when other tragic ships are all but forgotten is thanks to Hollywood. Belfast needs to remember that.